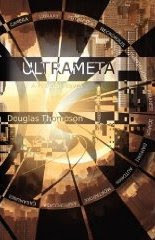 Douglas Thompson, Ultrameta. Eibonvale Press, 2009. Pp. 336. ISBN 9780956214713. £10.75. Ultrameta is hard to categorize. Part scifi, part detective story, part extended meditation on the human condition and the modern world. Its “hero” is Alexander Stark, a University professor, who goes missing, apparently amnesiac, and reappears after a decade, then kills himself. Or he and his wife, Charlotte, may have died in a car crash, and the novel’s entire setting may be fiction written by Stark. Or (again) they may both have flitted off to another plane of existence. Or perhaps it would be better to say that the hero is a consciousness that has existed throughout history. This consciousness was somehow tapped into by Stark, now (apparently) dead, and he wrote about his experiences from its point of view, moving from subject to subject, leaving that subject when he or she commits suicide and awakening the next day in a new body, often unaware of its history or what to do next. It/he/she is guided and aided by a mysterious group of “Keepers” who provide clothing, instructions, etc.. The book is structured as a series of short vignettes, which vary in coherence from straightforward narrative to poetic stream-of-consciousness. The many vignettes form a multifaceted view into this fragmented world consciousness, which some perceive more clearly than others. They are interspersed with scenes of the investigation into Stark’s disappearance by a detective inspector, Walter Dundas, and a reporter, Martha Lucy, as they find connections between Stark’s stories and events in the real world. As an example of how the book turns in on itself, these inserts were found on Stark’s body after his suicide. So he has been telling their story as much as they have been reading into his. The tone of the book is melancholic. Decay and alienation are constant themes. Humans and the structures they build decaying together and becoming one is recurring trope. Terrorism (especially 9/11), imagined as a confrontation between ancient and modern worldviews, casts its shadow as well, as do class and inequality. Ultrameta wears its classical influences on its sleeve: stories include settings like Roman Britain and Greek myth; the organization recalls Dante’s inferno, even with Vergil-like guides on the journey; chapter names are often Latin or Greek(ish) words. It also buys into the Ancient Greek notion (found in Hesiod, for example), that humankind is in decline from an ancient ideal (in which this collective (un)conscious was known and understood). This decline has evidently been going on for a long time—we get an extensive lecture from a Druid to a Roman centurion on the subject in one story. It doesn’t always get things quite right when it strays into ancient stuff: the plural of necropolis is necropoleis, not necropoli; Antonine is an adjective meaning “of Antoninus”, so Antonine’s wall is wrong; similarly, miles, not milite, and Picti, not Pictii. The book is many-layered and challenging. Sometimes too clever for its own good. For example, I found the stories that imagine an ancient mind confronting the modern world rather unconvincing (too much of a modern consciousness projecting itself outside and looking back), and the shifting focus tends to bog the reader down a little. Lots of it hangs together well, though, and it’s fun to go back from the finish and re-read, seeing connections where they weren’t apparent before. On the whole, the book is an interesting, if not always successful experiment.